True jellies have life cycles that alternate between a free swimming medusa and a sessile (or attached) polyp. The moon jelly medusae have separate male and female individuals and reproduce sexually. Most jellies use broadcast spawning, eggs and sperm mixing in the water, but the moon jellies are brooding jellies. The male released a long, thread like sperm strand that is collected by the female. Eggs are fertilized within her body and she carries the developing eggs until they hatch into the larval planula. Once released, the mobile planula locates a surface to attach to and grows into a polyp. The polyp can live for years, and reproduces asexually by either budding to produce more polyps or by a process call strobilation, in which it transforms into a stack of discs called ephyra. The ephyra are released one at a time and grow into the more familiar, free swimming medusa. Moon jellies are abundant and there appears to be great fluctuations in their numbers from year to year. Although jellies are well known for their ability to sting, using harpoon-like cells on their tentacles to force toxin into their prey, the moon jelly possess little danger to humans. Two other species of Moon Jellies can be found on the west coast: Aurelia aurita and Aurelia limbata. A. aurita is native to the Atlantic but has been found off the coast of California. A. limbata is a more northern species and is found in the Bering Sea. Jellies can be found in aggregations of thousands of individuals and this group is called a smack. Moon jellies are commonly a translucent white but occasionally an individual will have a distinctive blue or purple hue, likely due to their diet. 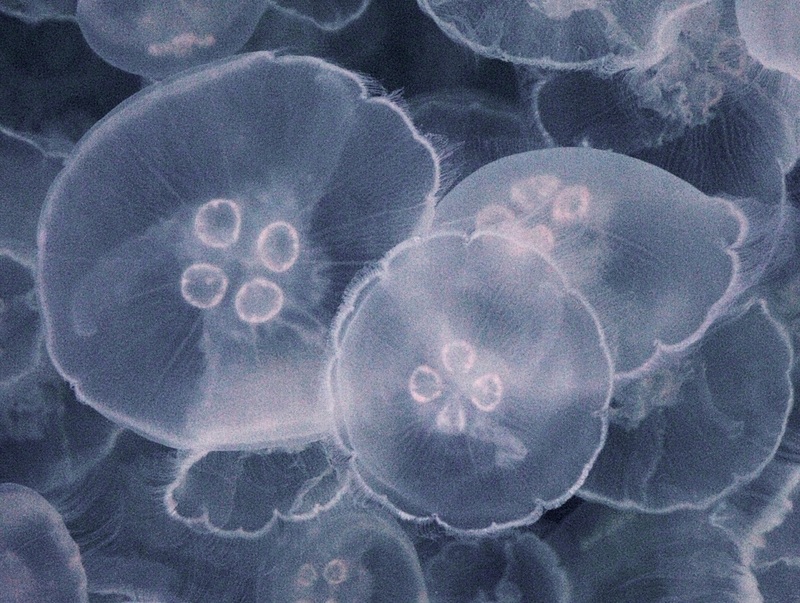 In aquariums where they are typically fed brine shrimp, moon jellies take on an orange tint. Jellies are plankton, animals which are not strong enough to swim against ocean currents. While plankton is often microscopic, some jellies can have bells more than 100cm (40in) across.